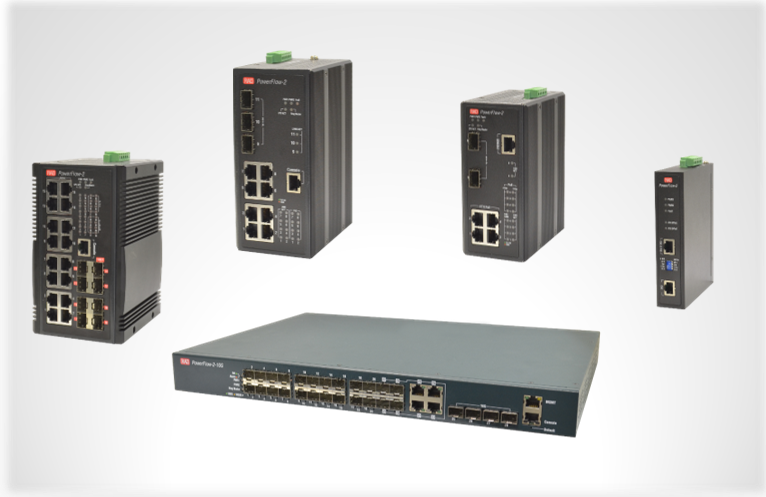 The PowerFlow-2 consists of managed and unmanaged industrial-grade Gigabit Ethernet switches, designed to build packet-based operational networks for critical infrastructure. PowerFlow-2 is ideal for operational networks of power utilities, railways, traffic controllers, and safe city applications requiring advanced L2 Ethernet functionality and power over Ethernet (PoE) support. Wide range DC power inputs with dual inlet. Redundant power supplies AC/HVDC, DC or combination. Beside the PowerFlow-2 and the PowerFlow-2 10G switches, this product line is also composed by the PowerFlow-2 Injector, a device used for different PoE requirements where non-PoE switches exist.